How to properly wire a ceiling light fixture? I rent an apartment and a tenant installed ceiling fan that was not well secured to the ceiling. I removed the fan and attempted to re-install the original light fixture after he moved out. I am having issues with the wiring. There are 2 black wires and 2 white wires in the ceiling. On the fixture itself there are 2 black wires and 2 white wires as well as a small ground wire. I try to wire it white to white and black to black. When I turn the power back on, the light switch is off but the light comes on. If I turn the switch on it's blows the breaker? Should I have 4 connections 2 x black to black and 2 x white to white or should I have two connections - all black together under 1 cap and all white together under 1 cap? What am I missing? How should this be properly wired? Or is there something else going wrong (maybe an issue with the fixture)? The power (from the breaker) is likely at the light fixture. When you hook black to black and white to white, the light is powered directly from the breaker. 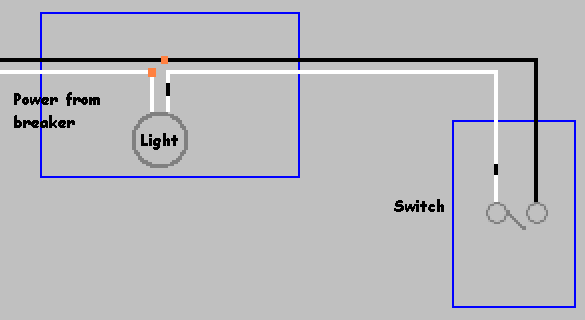 In this configuration, when you flip the switch on you create a short through the switch. What you need to do is hook it up like this. Notice the white wire that runs between the switch and the light has a black stripe on it (in above image), that lets anybody that works on this light in the future know that the wire is switched. You can mark the wire using a bit of electrical tape, or a marker. Figuring out which wires come from the breaker, and which go to the switch will require some tools. First Turn off the breaker, and verify the power is off using a non-contact voltage tester. Now pick one set of wires to work with first (one black and one white from the same cable). Turn the switch to the on position, and use a multimeter to check continuity between the two wires. 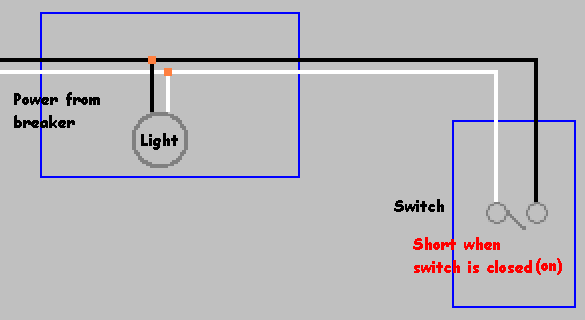 If the wires are connected (low resistance), these are the switched wires. If not (infinite resistance), check the other set of wires. If neither pair pass the test, contact an electrician. If at any time you don't feel comfortable doing this work, or you don't have the proper tools to complete the task. Contact a local licensed electrician. I'm willing to bet that the line from the breaker goes directly to the fixture, and then there's a line run to the switch. To test this, get a meter. Unhook the fixture and label the blacks, B1 and B2. Make sure there's no contact/shorts and turn the breaker on. If I'm right, then one of the blacks should show 120V with ONE of the whites. This would be the line to the breaker. The other pair should show nothing - with the switch both on and off. Label the hot pair. Turn the breaker off. Now, flip the switch on, and do a continuity check on the cold pair. It should show a low resistance with the switch on, and open line with the switch off. If (and only if) this testing checks out, then you can wire up the light. Put a piece of red or blue tape on the cold black and cold white to indicate that these go to the switch. Open up the switch and label the other ends with the same colour tape. Now the coloured white should go to the black terminal of the lamp, and the uncoloured white (back to the breaker) should go to the white terminal of the lamp. Also ground the fixture with a bit of bare copper. Short instructions: After testing, wire the blacks together, and the two whites to the lamp. Label everything. It can also be a bad switch. The same thing just happened to me. Using black and white the power was on all of the time. I wired it up correctly using the red, but then the light wouldn't come on. All of a sudden it came on by itself. I played with the switch and found that it was intermittent! Replace it with a new 49 cent switch (15 amp) from the junk box in the garage and BINGO - fixed! Thank you, offending switch for your confession! Not the answer you're looking for? Browse other questions tagged electrical wiring light-fixture or ask your own question. How to wire in my replacement fluorescent light fixture? How do I wire my light fixture? How should this light fixture be connected? How should I connect this new ceiling light?